June 8, 2012 — An emerging rift among senior members of TPLF Central Committee has prompted Prime Minister Meles Zeanwi to hold an emergency meeting in Addis Ababa to defuse escalating tensions, according to a source with ties to the government. Frustrated by the border dispute with neighboring Eritrea and the devastating economic down turn it has caused on their home region of Tigray, TPLF bigwigs questioned the premier if this strategy is in the long-term interest of the Tigrayan people. Moreover, an adviser for the president of the Tigray Regional State, Mr. Roman Gebreselassie, voiced his concern with the rising popularity of a little-known rebel group called the Tigray Peoples Democratic Movement. 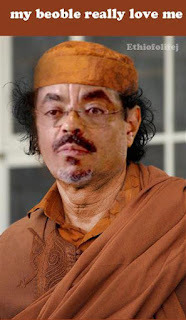 He criticized Zenawi for failing to create jobs in his region and suggested his perceived indifference for the welfare of Tigrayans has given this rebel movement favorable conditions to recruit Tigrayan youths. Recognizing mounting corruption as a major problem within the country, Dr. Tedros Adhanom, Minister of Health of Ethiopia and Abay Woldu, President of Tigray Regional State, noted corruption has become a normal activity among senior EPRDF members and suggested serious measures need to be taken swiftly before it becomes a national security threat. During the conclusion of the emergency meeting, Zenawi acknowledged most of his compatriots' grievances were legitimate and agreed a larger allocation of funds should be provided to Tigray in the upcoming fiscal year. However, the premier blamed Tigray's economic hardships on regional leaders failures, rather than blaming his increasingly unpopular "no war, no peace" strategy with neighboring Eritrea that has scared away potential investors and hampered the local economy.